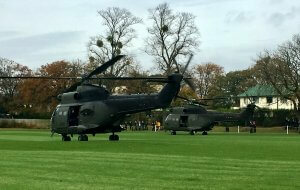 St Edward’s today hosted the Royal British Legion, members of the press, several visiting schools, RAF service personnel and two Puma helicopters on Upper 1. Why? The launch of the 2017 Annual Appeal for the Oxfordshire County Committee of the Royal British Legion. The two Puma MkII helicopters launched from RAF Benson with Group Captain Hamish Cormack, the Station Commander at RAF Benson, on board. The Group Captain was escorted on the journey to the School by eight senior members of St Edward’s Combined Cadet Force and accompanied by World War Two veteran Ken Hicks. The helicopters flew over central Oxford and up St Aldate’s, passing over the War Memorial, before landing on the school’s pitches with a large welcoming party of dignitaries, as well as pupils, staff and members of the public who had been awaiting their arrival. Veteran Ken Hicks then presented the first poppy which was purchased by the Lord Lieutenant of Oxfordshire, Tim Stevenson, to officially open the fundraising on the 2017 Poppy Appeal. Pupils were able to examine one of the helicopters up close whilst it was landed and chat with its flight crew. Several pupils were interviewed in association with the launch of the Appeal; Nellie Bates and Huw Neville were on the BBC Radio Oxford Breakfast Show (available from 1:47:00 in) before joining the other cadets for the flight back to School from RAF Benson, whilst there were also interviews for JackFM, ITV Meridian and BBC South television.